From Zhou Hui to Hui Zhou | ~ a simple interpretation of "When in Rome, do as the Romans do"
~ a simple interpretation of "When in Rome, do as the Romans do"
Born in the central part of City Beijing and lived there until 2005, I moved to Nova Scotia. Its attributes and the natural beauty grab my heart at once. I must write it down and must loudly tell people, especially my fellow Chinese, its stories I collected here and there on the semi-island where I call it home. To me, writing had been a hobby along with my over thirty-year science journey before one more good fortune embraced me in early 2016. Today, confidently and professionally, I can say I am a bilingual (English/Mandarin Chinese) writer! How was I shaped? Being a tottered baby girl and carrying a tiny watering can, I followed grandpa in his garden in our family yard of Beijing. In late 1960s, at thirteen, I started to learn the basic things for living when mom took me and my younger sister to a remote countryside near the Yellow River. No doubt, early family education determined me loving all vivid lives. I studied entomology in university. The rich culture and history along the banks of Yellow River rooted in my life. Chinese language like a strong magnet pulled me towards it. My interest in writing one day developed into an abiding passion. English later widens my capability of writing. What was about my over thirty-year long journey in science? With all learned about insects, after graduation, I wanted to be an entomologist working in farmlands, but mis-hit medical entomology with flies, mosquitoes and cockroaches…Following a logic, vector-borne disease control, its epidemiology and health quarantine stepped into my career. I hopped, but landed on food science, food analytical chemistry, precision instrumentation and laboratory quality control/quality assurance. I did once go back to my favorite field, integrated agriculture-pest management (IPM). That’s my master thesis study in Saint Mary’s University in Nova Scotia, Canada with a co-op work in Agriculture Agri-Food Canada. However, it did not last long. After graduation, unexpectedly I explored such science as cannulation surgery in rats, research assistance on Niemann-Pick type-II disorder and high-tech mouse breeding. Later, I worked on coagulation-based diagnostic product studies for over seven years. What a great combination it is in my scientific package! All these, excellent education, interesting life experience and hybrid working skills make me today. With diverse interests and an open mind, my writing, therefore, covers many subjects and crosses different markets/fields. My first creative non-fiction book was published in May 2018. No doubt, its positive effects extend to more fields, like the interpretation and translation work associated with language service providers and the Justice System in Canada. Gardening, a heritage from Grandpa, remains my favorite pastime. 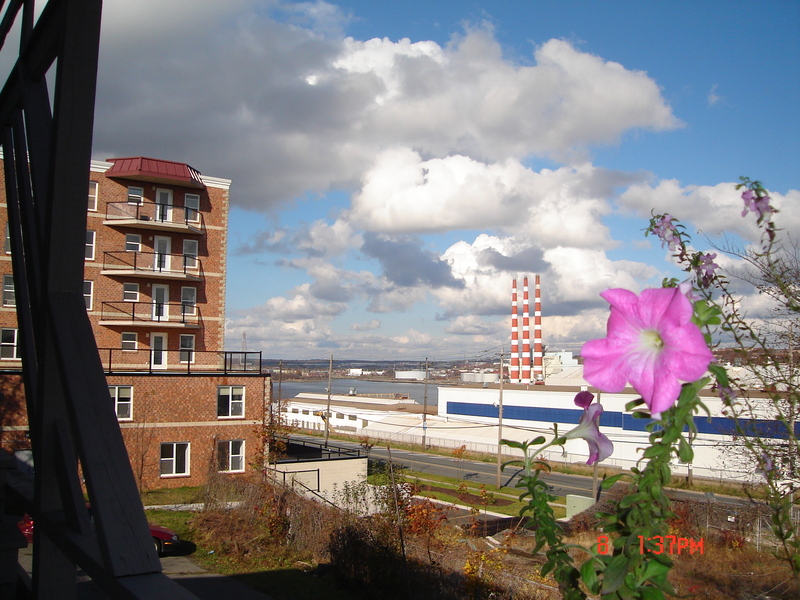 In fall 2007, my daughter and I moved into an apartment building in the north end of Halifax. Our deck faces the Shipyard and overlooks HalifaxHarbor. Watching the gentle waves, the sea gulls, the vessels and the sun hanging above the water is becoming one of my favorite pastimes. I am originally from Beijing and seldom had the opportunity to be such close to a harbor. One sunny morning, I stood on the deck, sipping a cup of coffee while enjoying the view of the Harbor. My eyes once again touched the area to the north of the Shipyard and my heart skipped a beat. 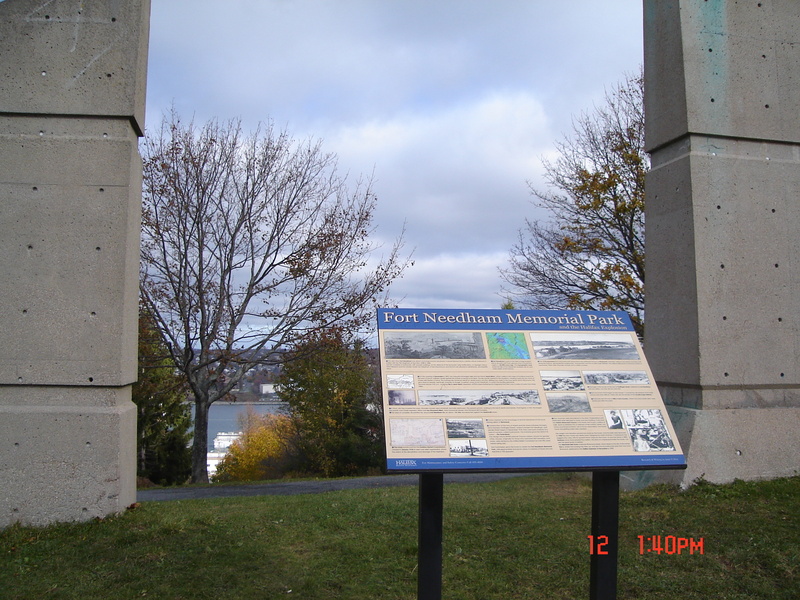 Was it the devastated area around “Pier 6” where the Halifax Explosion happened on December 6, 1917? Had the Richmond Railyards been located there? I hurriedly began digging through my unpacked boxes and pulled out a book called “Explosion in HalifaxHarbor,” which I bought two years ago. A map in the book confirmed my feelings that I was looking at the exact site. As a Chinese, I had never even heard of the Halifax Explosion before moved to Nova Scotia. However, a very fortuitous series of events brought me to the history. When my daughter and I immigrated to Canada, we first stayed in Wolfville, a landscape-like small town belonging to the Annapolis Valley of Nova Scotia. We lived in a house with Ms. Janette Snooks, a nurse and community caregiver. The house had its bedrooms upstairs with living-room and kitchen on the ground floor. One day I noticed that a framed newspaper article with a gentleman’s picture in it hung on the wall in the turning corner of the stairs. In the living-room, two pictures particularly caught my eye, too. One was the same gentleman in the framed article. Another was of a woman. Out of curiosity, I stood at the stair corner and read the article. 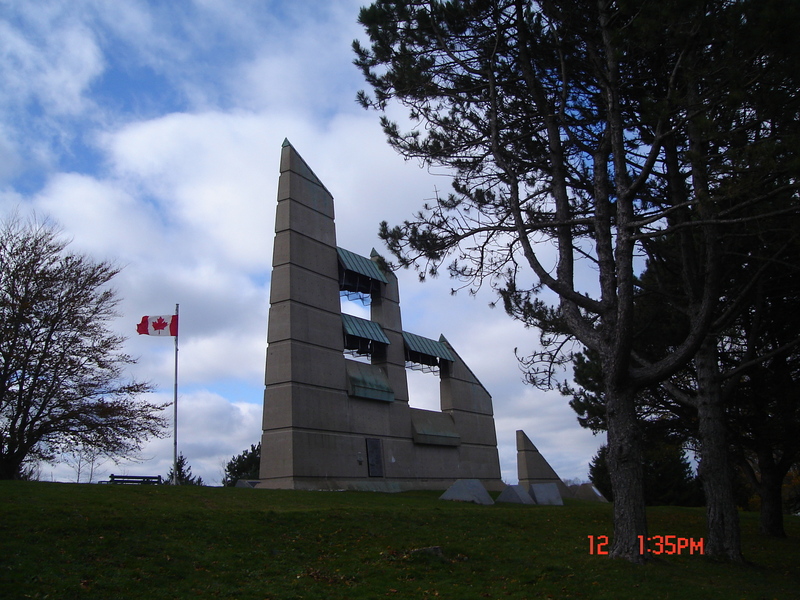 It described the most significant explosion in widespread devastation, killed about 2000 people and 9000 injured in the blast in HalifaxHarbor on December 6, 1917. The gentleman in the photograph was Vincent Coleman who worked at the Richmond Railyards. It was only a few hundred feet from Pier 6, where a vessel called Mont Blancloaded over 2,900 tons of explosives and flammable material drifted ashore in flames after colliding with another vessel, the Imo. Warned of Mont Blanc’s explosive cargo, Vincent turned to his telegraph key to stop incoming trains. 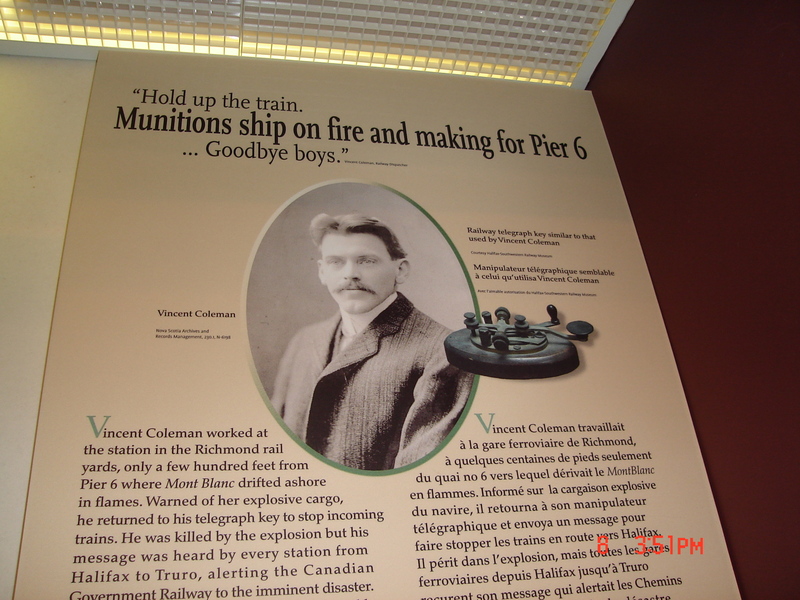 His message was sent out just in time and a train was successfully stopped outside of Halifax before the Explosion. Thanks to Vincent’s message, the Canadian railway system responded quickly to the disaster and sent relief trains with medical help to the ravaged city. Vincent Coleman’s body and belongings were later recovered and he was named a hero for his quick thinking. I could not help but to ask Janette who Vincent was. She told me he was her late maternal grandfather. The woman in the living-room picture was his wife, Frances. In 1917 Janette’s mother was just a baby. She and Frances were two of the survivors. Because of Janette the history of the Halifax Explosion suddenly seemed very real to me and was brought to my life accidentally! After listening to her story, I felt differently whenever passed the picture frame in the turning corner. Janette also showed me a book, “The Halifax Explosion”. The author interviewed her for the book. Opening the book, I saw the same photos of Vincent and Frances in the living-room. I glanced at the book’s dedication, “For my husband, Doug” without paying much attention to this at the time. I wished I had the book, so looked for it in Wolfville, but did not find it. By chance I bought another informative book, “Explosion in HalifaxHarbour” by David B. Flemming though it was expensive for me. A short time later, I was told my Masters supervisor, Doug’s wife, Joyce had written a book about the Explosion. Having checked, I ensured the one Janette had loaned me was, in fact, by Joyce Glasner. The dedication, “For my husband, Doug” I had not paid much attention last time really made sense to me this time. Finally I met Joyce and she sent me a copy of her book. Opening the cover, I found I owned a signed copy. 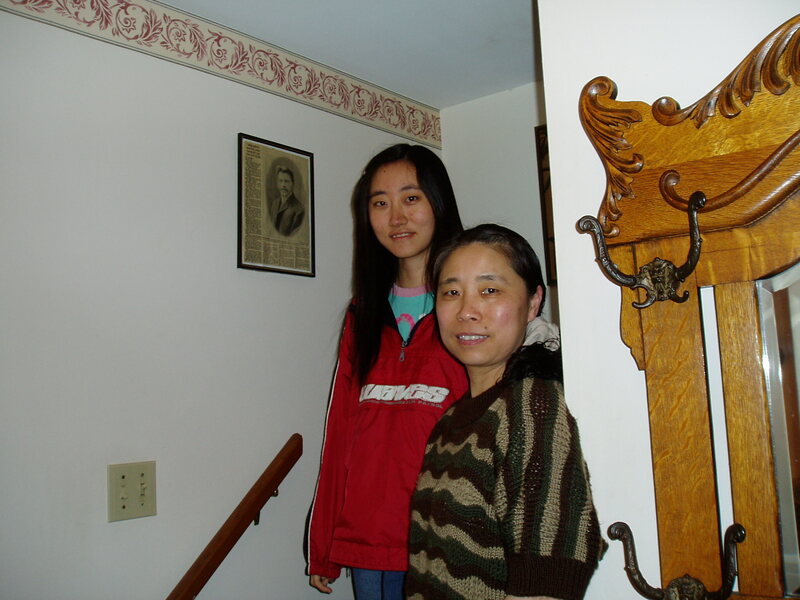 Amazingly, the experience with Janette and Joyce brought me closer to the history and made me more familiar with the Halifax Explosion than what I, a person from China, had ever expected. I could not help, once again, but felt more about the history especially after I moved to the north end of Halifax and found most of the historical sites could visit by walking. 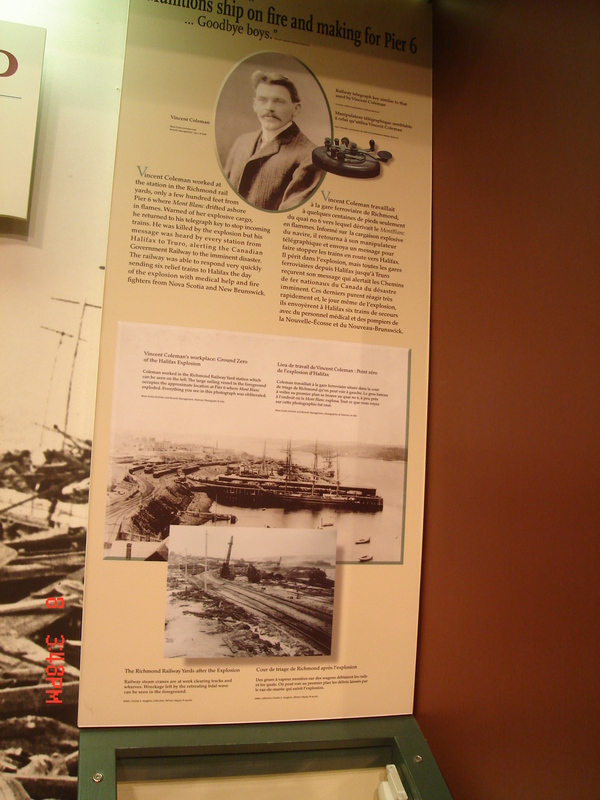 I once stopped over at MaritimeMuseum of the Atlantic an entire afternoon one day to visit the exhibition of Halifax Explosion, to watch the video with the horrible pictures of the ruins and to listen to the pitiful description. 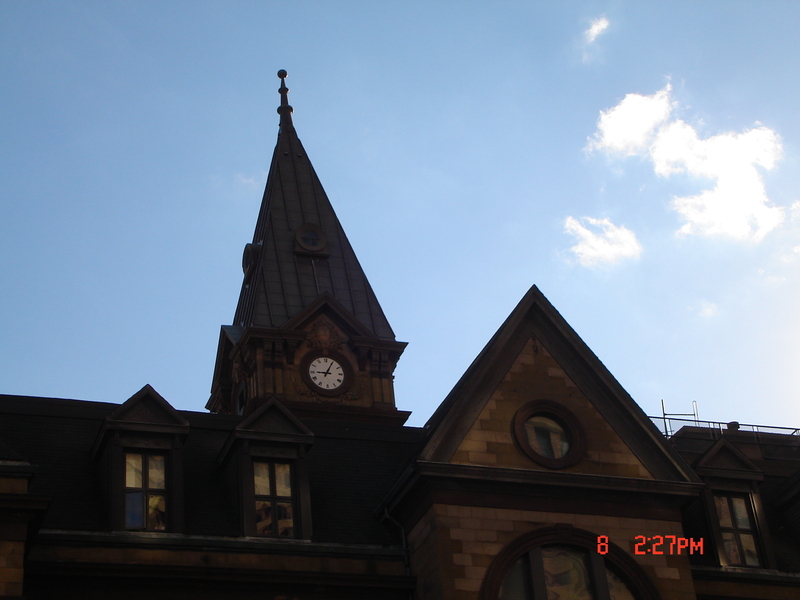 From the corner of Barrington Street and Duke Street, I looked up to the north face of the City Hall Clock. It was permanently stopped to 9:05 a.m., the time that the original clock stopped as a result of the Explosion. 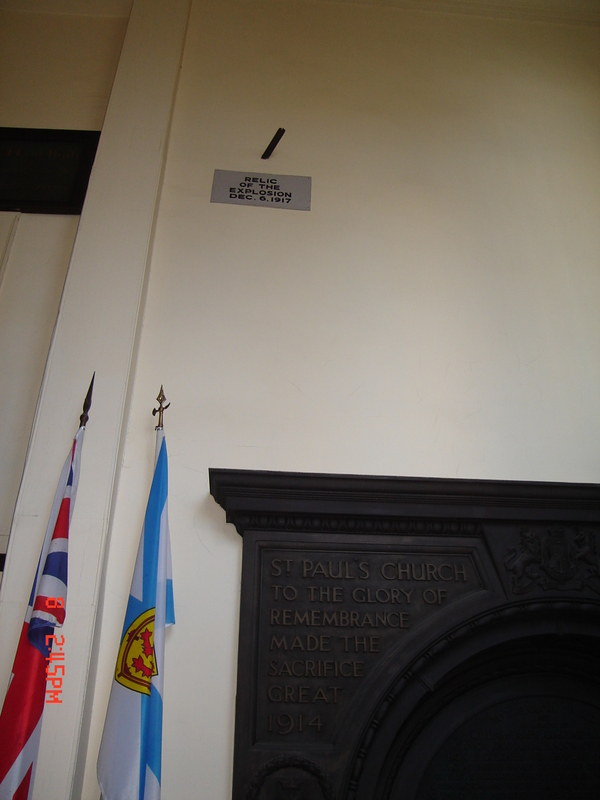 I quietly opened the front door of St. Paul’s Anglican Church and found the piece of metal from Mont Blanc remains flown through the glass window and then embedded above the door in the inside wall of the porch. 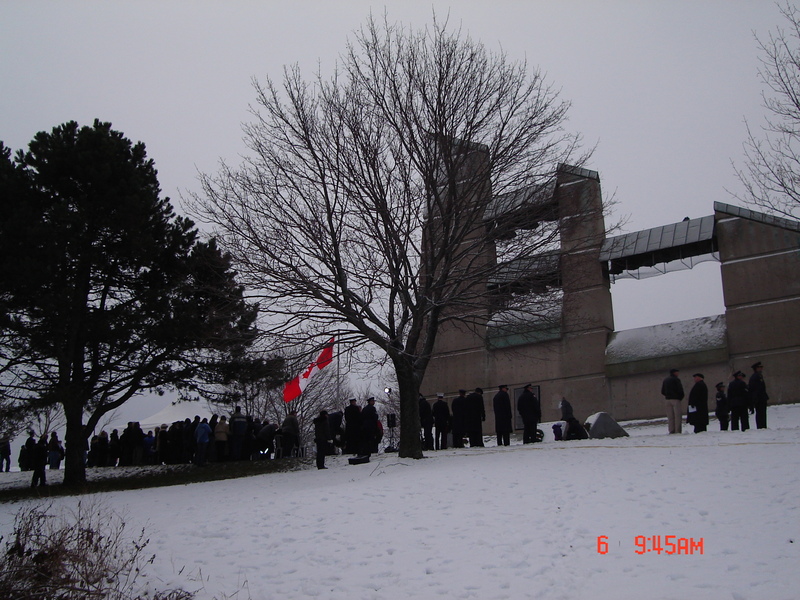 I reviewed the name list of those who lost their lives in the Halifax Explosion, I found two of them were from China. 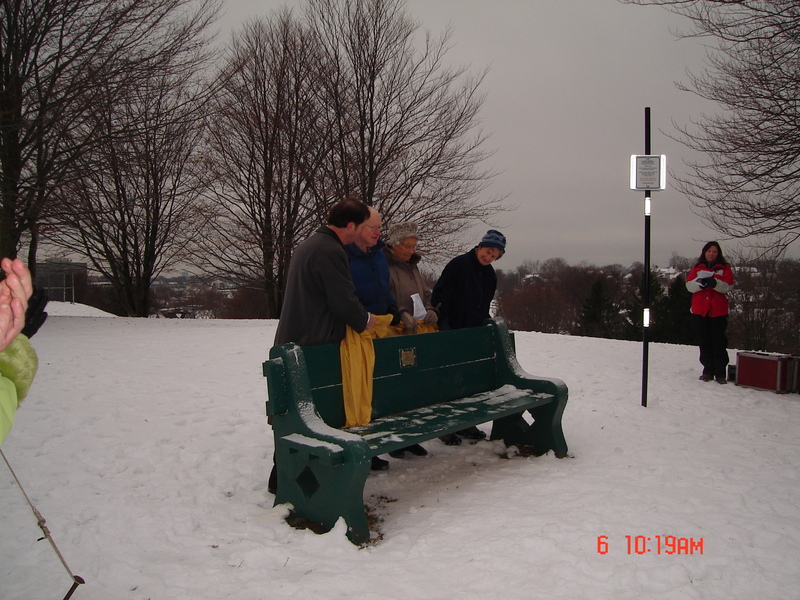 I attended the 90th annual memorial service at Fort NeedhamMemorial Park on December 6, 2007. On that day, I met two of the survivors who are at their late 90s, while I also saw a lot of teenagers and youngsters standing with the grey or white hair in the cold and chilly December wind in memory of the event. As only Chinese, my attendance caused people’s curiosity and attention. Some gaze made me feel I was an alien. Probably they were reasonable –it was really weird–a Chinese woman joining such local event with mostly local Canadians. However, I have stories related to the Explosion, which they did not know, which I like to share with them. My understanding of Halifax is more than they expected that a Chinese woman should have, and my feelings to Halifax are far beyond the whirl and the noises, the peace and the beauty which they feel and I feel everyday. If one child in the world calls Santa Clause “Grandpa Santa”, it must be our daughter, NiuNiu (pronounced NewNew, in Chinese a cute little girl). Her stories with “Grandpa Santa” started during her childhood in Beijing China. Six-year old NiuNiu with one foot left kindergarten and another stepped into primary school. Wow, the outside of kindergarten was so different and amazing! Her curiosity for the new world was rapidly accumulated and eventually overflowed: only 15 days after her enrollment, she skipped school at lunch time with one of her classmates right under their teacher’s nose and played the whole afternoon in a public garden nearby. “What was wrong with NiuNiu?” We asked ourselves. It seemed nothing. She was just like a little tree eager to reach the sky. How could we “trim” it without hurting the tender growing tips? “Yes, why don’t we bring Christmas to her life and let her know Santa watches year round”! In China, Christmas was not (is not) an official holiday, but we decided to celebrate it for NiuNiu. Thus for the first time, at 6, NiuNiu heard about Christmas and Santa. Little NiuNiu at once loved the incredible myth, liked the white-bearded old man, HoHoHo and insisted on calling him “Grandpa Santa”. She did not skip school again and everything was maintained quite well since she knew Santa was over there. One day, however, NiuNiu shared me her worry: “Mom, does Grandpa Santa mind a mistake in my homework?” “What’s up?” I asked. “Mom, is 5-3=2 right?” “Yes.” “Why did Teacher Hu still mark an “X” beside my “2” that I have erased and re-written twice?” When I glanced at her 5-3=2, I almost burst out laughing. Her “2” was backwards! No matter how many times she corrected, the “2” was consistently written backwards. No wonder Teacher Hu kept giving her “X”. “Oh, my dear, Grandpa Santa couldn’t love it more, I am sure!” I cheered her up and saw the little one badly tortured by the “2” breathed easily. On Christmas Eve, after solemnly hanging a bag on the balcony of our apartment, NiuNiu unwillingly went to bed. The next morning, she got up much earlier than usual. Still half asleep, she smiled secretly and walked cautiously towards the balcony with both hope and uncertainty. When she touched something in the bag, she fully woke up: “Mom, Dad, gifts from Grandpa Santa!” Her little voice rose: “Look! A pencil box with pencils, a ruler, eraser and a pencil sharpener……two bars of chocolate, too!” That special morning, NiuNiu, carrying a school bag full surprise and excitement, hopped joyfully to school, the only child there connected to Grandpa Santa! 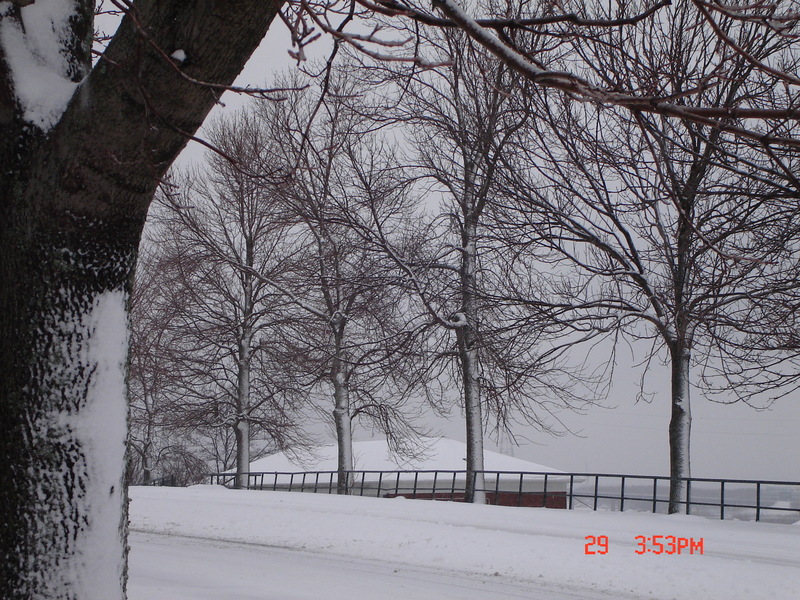 Since my daughter and I moved to Nova Scotia, Canada in 2005, we have explored real Christmas and become part of it. Still, nobody among our three has pointed the secret out. The night on Nov. 17, 2008 after work, I drove in Halifax. It was my third road training with an instructor at Ha’s Driver School, and my first time of running a vehicle in the darkness. When we were closing to Sackville Street on Barrington Street, the instructor showed me the site where a young woman was struck under a dump truck when she was crossing the street that very samemorning. The first response of mine was if my daughter was at home. Yes, she was. One hour ago we talked on the phone. Although I confirmed and ensured my daughter was safe, the news had made the hair on the back of my neck stand up. I felt extremely horrible that life was taken away in the blink of an eye! However, if the driver checked one more time, if the woman checked one more time, the tragedy might never have happened. The rest of the driving at that night was filled with more “mirror, signal and shoulder check”. My eyes had never been as busy as they were. “Defensive driving” hit every object it could reach, and its echoes never died away in the dark as if the driver school teacher emphasized it again and again during the 25-hour in-house education sources. By the end, the instructor summarized and commented on my night performance-I did not see people emerged from the back of a parked car once, I almost missed a “stop sign” once, I skipped “mirror check” twice before brakes, I ignored road signs more than three times, I did not read the road ahead when I made turns, I should be much more alert than I had been while driving……All in all, to me there would be a long way to go in terms of a good driver and then a defensive driver which is my goal. Honestly, the original reason why I decided to go back to a driving school was for car insurance. When I was thinking about buying a car, I checked with insurance companies, the insurance to me without any insurance record and driving education in Canada would be more than $3000 a year though I was issued a class 5 Nova Scotia driver licence in 2005. Therefore, I registered at the driving school in October. Now looking back the education and trainings obtained, the value is much more than its price, $595, and the significance is far beyond getting a low insurance. In addition, the necessity taking the education, or returning to a driving school may not be just to me only. One of my colleagues, I am sure she has been driving a car or cars for many years, told me that she would like to go back to a driving school to refresh or update the knowledge and improve her driving techniques if she had time. If it became one of the priorities, she would do it soon, I believe. 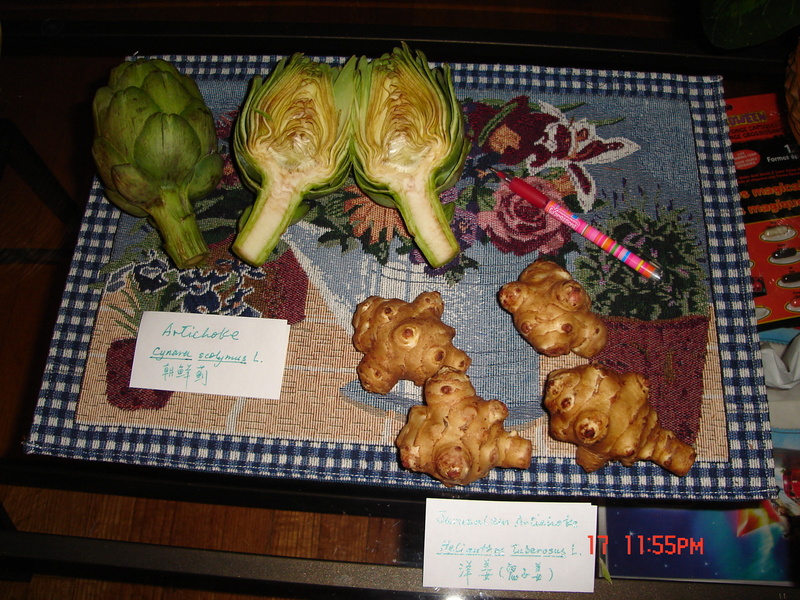 One of my Chinese fellows and good friends, whom I met at the Kentville Research Station of Agriculture and Agri-Food Canada in 2005, offered me rides when I went home sometimes since we both worked at the station and lived in Wolfville. First time when I showed him Winter Street where the house I lived located, he hit the brake and stopped the car just in the middle of the street near Winter Street. I thought I interrupted him, so he stopped (parked) suddenly. However it happened identically at the second time. This time I could not help but asked him why his curb-side wheels were about two meters away from the street curb, instead of within or close to 15 centimetres according to the Nova Scotia Driver’s Handbook. I could barely stand this though he was a good friend, and was also surprised how he passed the driving road test and received a driver licence of Nova Scotia. He perhaps was terribly embarrassed because of my outspokenness. However, it is the rule everybody must obey for the safety of lives, his, mine and others (My dear friend, if you read here, please do not be mad at me). There have been a lot of stories of conflicts on road heart from people around me. I also saw some drivers driving as if they were number one on the road drove beside me. I did encounter pedestrians showing up on the street at very wrong places when I drove. The tragedy that happened on the corner of Barrington/Sackville Street on the 17th of Nov. has not been forgotten. Therefore, I would like to pack defensive driving and defensive walking in a box as one of my Christmas gifts because I am starting to play two roles, in other words, I will be the both, a driver and a pedestrian on streets after I have a car. As I have learned, people in China usually have heard about British Columbia and Ontario more than Nova Scotia. 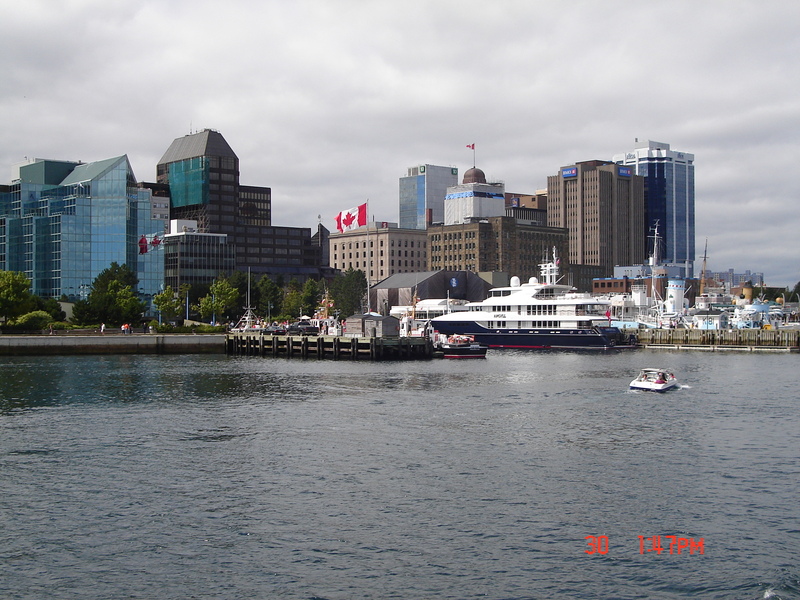 Halifax, too, is far less popular to most Chinese people than Vancouver, Toronto, and Ottawa. I had been one of those Chinese who knew nothing about Nova Scotia until one day in 2004, my feet touched the land, and I was thoroughly embraced with the waters, the woods and the fields, the colour, the sound and the smell. I was especially attracted by the stories related to its history – the unique treasure in Canada. Without knowing its history, I would have no feelings to the word “Acadian”; I probably would never stop with intention on Barrington Street in Halifax and look up to the north face of the City Hall Clock which was permanently stopped to 9:05 a.m.; I would never think about the significance behind the beauty of the New Ross Farm, the charm of St. Margaret’s Bay, the well-preserved properties of the Annapolis Royal, “The Island of Seven Cities”- Mr. Paul Chiasson’s discovery of the remains of a possible ancient Chinese settlement on Cape Breton Island, and the scenic waterfront of Halifax Harbour……which are our heritages in Nova Scotia. What I have seen and felt in Nova Scotia reminds me of the ancient City Wall and Gates in Beijing, which were built in the Ming Dynasty (1368 to 1644). Sixteen city gates connected the city wall with Inner City and Outer City of Beijing. Most gates were demolished in the 1960s-1970s because the government wanted to develop or rebuild the old city, starting with an underground railway system right beneath the Wall and Gates of the Inner City. I fortunately still remember the Wall and the Gates, since I was born in Beijing in 1950s. My sister, six years younger than I, has very dim impression about them. My daughter never had any opportunity to view their majesty and magnificence. Not only the City Wall and Gates, but also other historical buildings, such as Si-he Yard (the unique style of houses/yards in Beijing, and most of Hu-tong (the system of Beijing city streets) have been replaced by huge concrete apartment or commercial buildings. Perhaps the impression about Beijing as a well-developed and quite modern city, as shown during the Beijing Olympics in August 2008, is still remaining. However, there is little left for people in the world to feel and enjoy its ancient rhythm, the heritage identities, and the taste of real Beijing. The demolition of historical structures was one of unforgivable human mistakes, and a huge tragedy to the history of Beijing, China, and the world. I worry about less and less heritages left for our future generations, no matter where heritage is wiped out amidst the conflict between development and the protection of historical properties. Without the concern and worry, I would not be easily brought to a halt by some pictures, books, and a talk between walkers and two members of Heritage Trust of Nova Scotia, which happened just outside of the entrance of the Halifax Farmers Market on one of the busy and beautiful Saturday mornings in October, 2008. The members of the Heritage Trust were worried because the Armour Group had applied to completely demolish two buildings in the central block of Historic Properties: the wooden Peter Martin Building at 1870 Upper Water Street and the Imperial Oil Building at 1860 Upper Water Street. In addition, almost all but the facades of other heritage buildings, the Fishwick Express Building at 1861 Hollis Street, the Harrington Building at Hollis Street, would be demolished in Halifax……After having listened for awhile, I joined the talk and told them the stories of City Wall and Gates in Beijing. I also voluntarily signed their petition and promised them I would write to Halifax Mayor Peter Kelly and Members of Regional Council. Halfway through this essay, my writing was stopped by a terrible cold. When I had energy to go back to the essay, I discovered the news on Page 1 of the Metro, October 22, 2008, that Regional Council had rejected demolition of a block of heritage buildings on the Halifax waterfront. I was extremely glad to hear that and believed the two members of Heritage Trust of Nova Scotia, whom I met on that Saturday, must have a big relief while learning the good news. Could we have a break? Heritage Trust of Nova Scotia president Philip Pacey said he was “absolutely delighted ” by council’s decision, but there was still work to do because Armour owns the buildings and had applied for a demolition permit for one building and holds a permit to demolish another. It seems there is no break for Heritage Trust of Nova Stotia, for Mayor Peter Kelly, and Members of Regional Council, nor for people like me. Therefore, I keep writing, starting this essay with the story of broken Heritages in Beijing, China and closing it with the unfinished story of other Heritages in Halifax, Nova Scotia, Canada.